Safariland 7360 7TS ALS Level III Retention Mid-Ride Holster FREE SHIPPING! The 7360 7TS Level III Retention™ holster from Safariland carries your firearm in total safety, making it almost impossible for a third party to draw. The Automatic Locking System (ALS®) secures the weapon when holstered while still allowing a smooth, straight up draw when deactivated. A Self Locking System (SLS) Rotating Hood provides an added layer of security, and the optional Sentry elevates the holster to Level IV Retention™. Safariland's proprietary nylon blend is extremely durable, yet completely non-abrasive to the weapon's finish. The strategically raised interior allows dirt and water to clear away quickly from your firearm. The holster is able to withstand temperature extremes from -50 to 300 F, and it can also be submerged in water indefinitely without any change in shape or reduction in function. The matte finish reduces light reflection for extra concealability in low-light conditions. 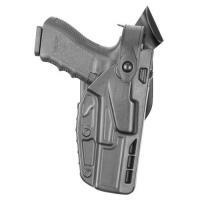 This holster is one of the most durable and easy to use holsters on the market. It is the "glock" of holsters. There is no liner but there doesn't need to be one. Watch the safariland video on youtube and you'll understand the holster a little better. Do your research people. I bought this holster for duty use with a Glock 17 with a threaded barrel and an Inforce APL tactical IR light. The fit is good and there is enough room at the end of the muzzle to protect my extended barrel. I'm almost certain this holster would fit a Glock model 34 or 35. The rotating hood is a bit tight when it rotates but I'm sure with a few practice draws the action will smoothen. The only negative thing I have to say is that the holster has no lining on the inside to protect your guns finish from repeated draw wear. This holster is top notch. The gun and light fit like a glove. It's everything I've always wanted in a holster. The only thing I don't like is although the description says "mid-ride" I think it rides low to where it make it uncomfortable at times to sit because it hangs lower than a typical "mid-ride" should. All in all I would recommend this holster to anyone. I've had many non LEO's try to figure out how to get my firearm out and none of them can even get past the initial step. Great for retention. Wonderful holster, worked great for my G23 with Surefire X300Ultra. Is not suede lined and does wear the finish on your firearm. Also, the mounting screws for the UBL are shorter in this model than in the 6280 series. Not an issue, just a personal preference. Over all a wonderful and fast-drawing Level III holster. Best duty holster what a great product from safariland. Love the holster Works with or without my weapon light. Just wish it had some kind of liner in it. Great holster, I have gotten several compliments already. Great Holster, and the 7TS material is the smoothest draw. If you use a weapon light with a remote switch, be aware that it will NOT Fit. You'll need to get a rotary tool and grind out a channel in the material without comprimising the integrity of the holster. It can be done, but be aware. Without the remote switch, it fit perfectly. Excellent duty holster, holds my G22 Gen4 with Surefire X300 Ultra perfectly. We recently switched our agency to this holster after nine years with another Safariland holster model that has served us well. So far this new (to us) holster seems fantastic and has been well-received by the officers and our firearms instructors. I would recommend this holster to others who are considering it. The holster is very well built. When you hold it in your hand, it feels like a very sturdy piece of equipment. The holster is made from some sort of nylon blend and should be very easy to keep looking neat. I put a small scratch into the surface of the holster, and was able to buff it out with the green side of a scotch bright pad. Another bonus is the holster won't scratch the finish of the gun. I tried to scratch the slide of my Glock 17, with the edge of the holster. It did leave some black marks, but those came right off by buffing the gun with a wash cloth. The locking system holds the gun very securely and I don't think it would come out very easily. One more bonus is this holster WILL hold the firearm WITHOUT the light attached. It is a little harder to holster, but is still fairly easy. Yes, you can select "Sig Sauer P320" in STX Plain, left handed which will give you that part no. ©2002-2019 CopsPlus.com: Safariland 7360 7TS ALS Level III Retention Mid-Ride Holster FREE SHIPPING!